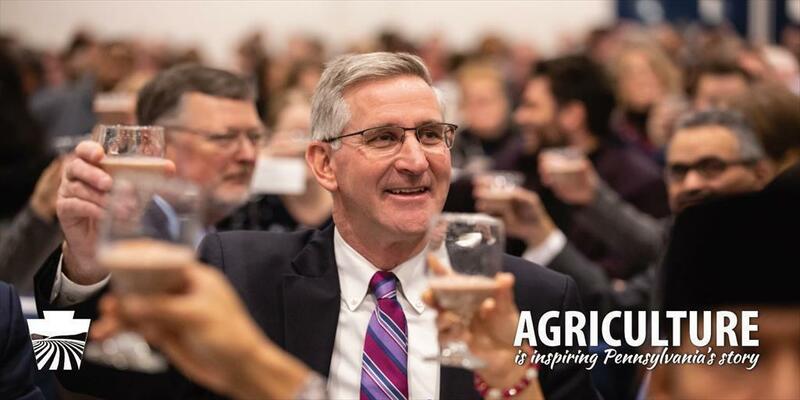 Secretary Russell Redding’s remarks from the Pennsylvania Farm Show's Public Officials Day Luncheon, delivered January 9, 2019. This year's theme – 'Inspiring Pennsylvania's Story' provides us an opportunity to highlight the significant contributions of Agriculture to our Commonwealth. Pennsylvania's story is inspired by Agriculture and is constantly evolving with new pages being written all the time. Every story has a beginning, a middle, and an end. As we work to tell the amazing story of Pennsylvania agriculture, we need to reflect on our past to inform the policies we form for the future. Each of you in this room have helped inform our story for many years, and we thank you for your leadership and stewardship. Over the past four years, we have worked together to identify gaps in the industry and enact meaningful change that will resonate with the millions of Pennsylvanians influenced by our decisions each day. One year ago, working with the Team PA Foundation and the Ag Advisory Board, we unveiled the most complete economic impact assessment ever produced on Pennsylvania's food and agriculture industry. What we found reinforced what we already believed: Pennsylvania's agriculture and food industry is an economic powerhouse, contributing $135.7 billion each year to our state's economy and supporting nearly 580,000 jobs statewide. It is 18% of the gross state product. Agriculture's reach is expansive – it touches the lives of people all over the commonwealth – it impacts them on a personal level. and creating new and more diverse markets for farmers, and improving infrastructure. These types of investments are critical to meet employers' expectations, for an increasingly technology-savvy and agile workforce. We've also set forth our strategic plan for the Department of Agriculture, because we need a map to navigate both smooth and rough waters. This plan will help us stay relevant and respond to the needs of business and consumers, positioning us as both effective advocates and leaders. I am happy to unveil these goals to you today. and making Agriculture the commonwealth's employer of choice. If we want to reach those goals, developing strong, thoughtful policies and providing continued industry support must be at the top of our priority list. As Secretary of Agriculture with, our PDA Leadership Team, we have traveled the state listening to Pennsylvanians and hearing their stories. We've talked to them about their challenges, and worked with them to identify opportunities. It's critical that we can gather these stories and bring them back to Harrisburg – as we work together to overcome obstacles and try to solve problems, their words and their voices must remain in our minds. It's not enough that we tell the story of Pennsylvania; we must let Pennsylvanians tell their stories themselves. Some of their stories are filled with optimism and hope, others less so. Some are steeped in generations of heritage and history, others are new. They are as diverse as the people who live and work in our commonwealth; all perspectives unique and valuable. One thing is certain, as we set the course ahead, and lay out the expectations that will guide our work, we must first have a clear vision for the future. and that we address the issue of hunger and support all Pennsylvanians, no matter which area of the state they call home. How do we get from here to there? How do we make this vision a reality? Over the course of history, there have been pivotal moments that have impacted our lives and shaped our story. A commitment to stewardship, advancements in technology, education and science, and the development of a robust food network have all played a role in determining where we are today. And behind those movements were the people making them happen. Industry leaders, champions, and trailblazers working tirelessly to affect change and spur growth and development. They are inspirational and aspirational, and they are the backbone of the story of agriculture. To each of you I want to applaud your efforts and your leadership. We value the partnerships you've built with us as we work together to accomplish our goals. The discussions you have with your constituents; the stories and perspectives you bring with you to policy discussions, all help inform our work. As we move forward, it is critical that we grow and foster strong relationships, have faith in each other and make the connections that we need to initiate change. We must plant the seeds for success throughout the industry, using our collective vision and strength to lift others up. We must not only be good storytellers, but we must also be exceptional listeners. Agriculture will be featured prominently in the chapters yet to be written. With over 550,000 acres preserved in agriculture, farming will continue to be an economic driver, creating jobs throughout the food chain and providing consumers with food security. Agriculture remains available to all who are interested in participating, from full-time careers to back yard gardens, and is truly Pennsylvania's "common wealth". We are blessed with universities at the cutting edge of a wide range of technologies and consumers who want to know where and how their food was produced. We have access to major metropolitan markets around Pennsylvania, and around the world. And we have you, as public officials who believe in still support agriculture's role to inspire in Pennsylvania's story.